Boat Dock Hardware | Dock Fastener Kit, 3/8" | VE-VE Inc.
Home :: POST Dock Brackets ( #5 ) :: ( #3 ) "POST DOCK BRACKETS" For 2" dock pipe ( 2-3/8" O.D. ). 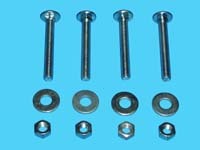 :: D-561; "Dock Fastener Kit"
(4 ea.) 3/8”-16 x 2-1/2”; Galvanized Carriage Bolts. (4 ea.) 3/8”-16; Galvanized Hex Nuts. (4 ea.) 3/8”; Galvanized Washers. FREE Shipping when ordered with dock bracket order.